On this page, we will feature some in stock items that are available for immediate sale. There will be a combination of Cheese Boards, Cutting Boards, Wine Display Racks, Bathtub Caddies and much more. Thunder Bay and area residents can arrange to purchase and pickup product locally. For those who would require us to ship product to you, please contact us to arrange a shipping rate and to arrange payment by PayPal, Interac E-Transfer (For Canadian customers) etc. Credit card purchases can be arranged as well by contacting us in advance. By request, we were asked to build bathtub caddies/ trays. This one is made of pine with a walnut stain and a spray on water resistant finish. Most will be closer to 32 to 34" in width, this one example in the photo was built to spec for a wider tub enclosure. New Cheese Board in stock, ready to ship. 14.5" X 9", built with purpleheart, cherry, walnut and oak, finished with a 100% food grade oil finish. Cheese Board in stock, ready to ship. 19.25" X 6.25", built with purpleheart, cherry and oak, finished with a 100% food grade oil finish. 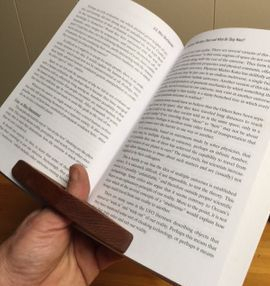 We have now been making these Thumb Page Holders for three years and we have sold hundreds of them! Additional photos will be posted right below this post. Just $10.00 each, these are perfect for every book lover! Also sold locally 6 for $50.00 (Great for Christmas gifts) or for out of town customers, to offset shipping costs, we sell 5 for $50.00 and we cover the shipping free of charge. Here are a few of our Wine Display Racks. These have been selling well now for over three years. 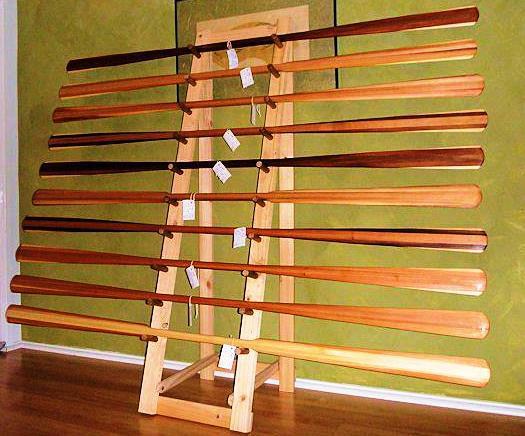 These ones, built from solid wesern red cedar, will look great in your kitchen or bar. 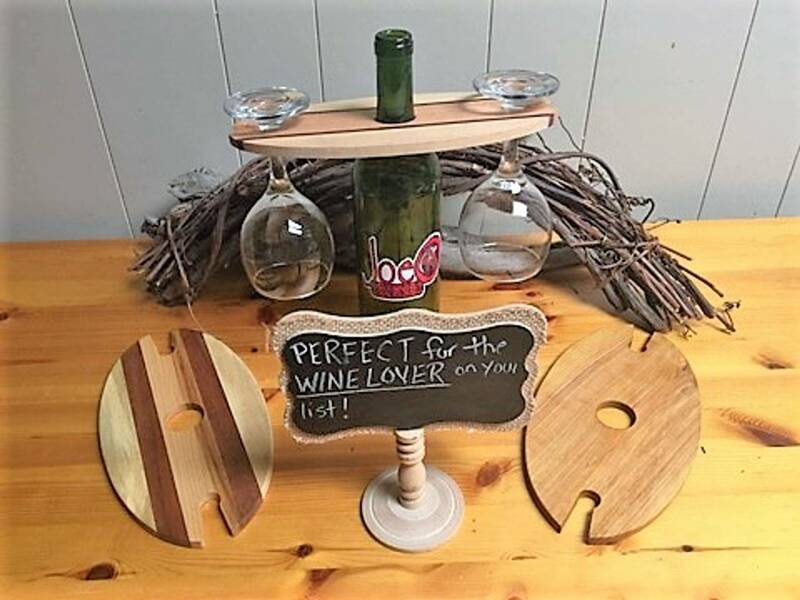 They also make a great gift for any wine lover. 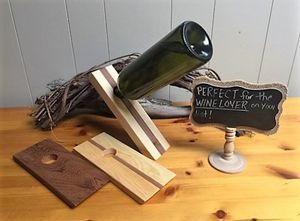 Now available, our "Magic" Wine Bottle Stands. Freestanding, made from a variety of different woods, these support a full bottle of wine and will balance on it's own narrow, angled base. Makes a great addition to your countertop, bar etc. Now selling from $15.00 and up. (Note...the dark brown one, from solid western red cedar, has been sold. The other two are available now. The one with the bottle, it has a strip of purpleheart running down the middle, adding a beautiful contrasting look. Handcrafted from premium western red cedar, this set of Drink coasters will look great in your home or can make a great and unique gift. Built from solid hardwood, we make these in single candle versions right up to, well as many as we want. Right now we have some in stock for 3 candles, 4 candles and a 5 candle version. Tea candles included with purchase. 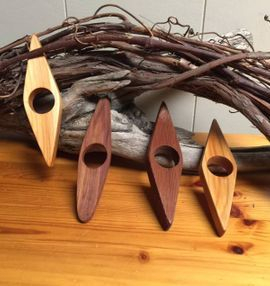 4 Candle Holder, $20.00 and so on. 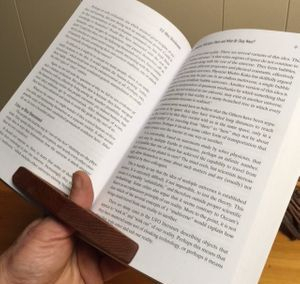 Handcrafted from premium western red cedar, we make these to hold anywhere from 6 to 24 pencils, pens etc. Looks great on your home office desk or at your place of work. This is another fun project that we use with our leftover premium western red cedar from our paddle building. 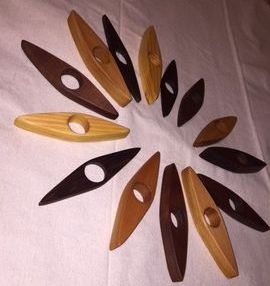 Made from solid western red cedar, measured and drilled out with 24 holes, secifically sized for use to hold crayons. The kids love them. And it is a great way to teach your children to put things away and to keep things organized. Priced at $20.00 and includes a full box of crayons. Finshed with a 100% Food Grade oil finish to ensure your childs safety.